Northridge Mall. Photo by Jeramey Jannene. 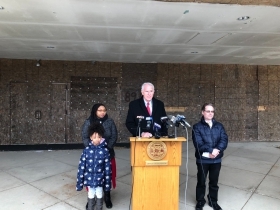 Mayor Tom Barrett and Alderwoman Chantia Lewis want action on the vacant Northridge Mall. 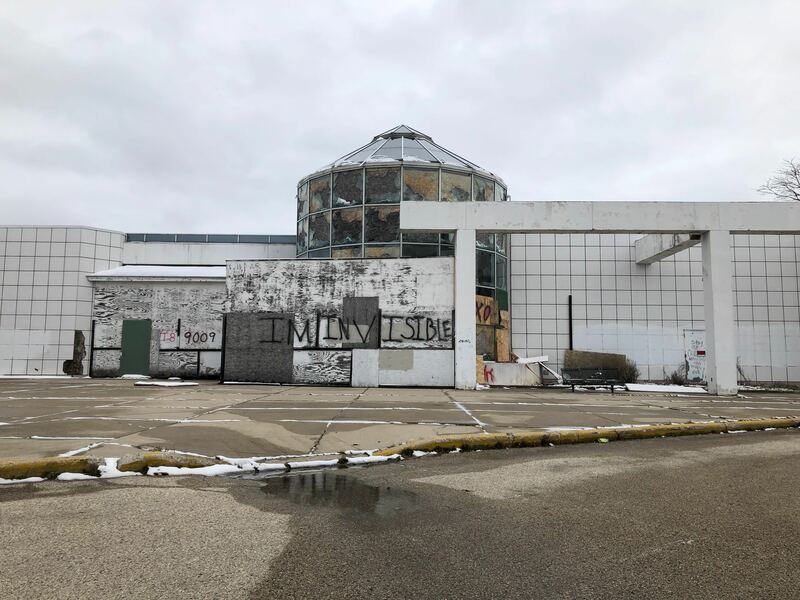 The mall has been closed for more than 15 years, but the city has been hamstrung in its ability to pursue redevelopment because the mall’s owner, a Chinese investment group, has declined to rehab the property or accept different purchase offers. 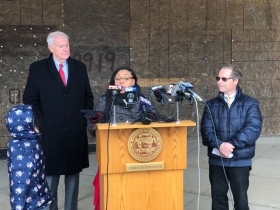 “Today we are saying no more,” said Lewis at a press conference announcing the city is condemning the building, a precursor to demolition. 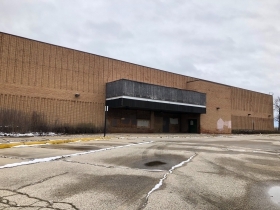 The ownership group, known as the US Black Spruce Enterprise Group, acquired the former mall in 2008 and announced plans to create a trade market for Chinese companies to sell their products to American consumers. But that project has not moved forward, much to the frustration of city officials. Lewis said she last met with representatives of the group when they were in town last fall. “They were very evasive and not willing to commit to any development,” said the alderwoman. She said she gets asked about what’s happening at the site every day. Barrett said he has never met with the current owners. A simple array of figures from acting Department of Neighborhood Services Commissioner Thomas G. Mishefske illustrates Marcoux’s claim of poor stewardship. The property was acquired by Black Spruce for $6 million in 2008 and includes almost 900,000 square feet of space. But today it’s assessed for only $81,000 and needs $6 million in repairs said Mishefske. The roof is failing, scrappers have illegally stripped many of the mechanical systems and the masonry is in disrepair. The cratering assessment and growing repair costs place it far below the 50 percent threshold of assessed value the city must meet before issuing a raze order. 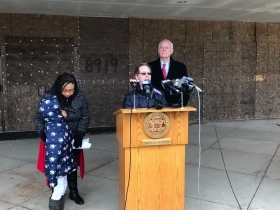 The city, through the Department of Neighborhood Services, has recently begun aggressively citing the company for code violations, including unsecured entryways. It issued the 20-day condemnation order this morning and could tear the property down if the owner doesn’t respond. The mall owners retain the right to appeal the order in Circuit Court. 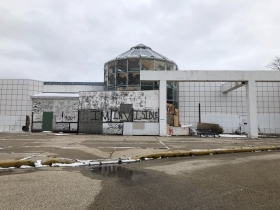 The cost of the demolition, which Mishefske estimated could range from $10 to $12 million before environmental abatement is considered, would be added to the parcel’s property tax bill and if it remains unpaid could allow the city to seize the building in property tax foreclosure. But the city is likely months, if not years, from getting to that point. It would have to absorb the cost of the demolition, an amount greater than four times the city’s 2018 demolition and deconstruction budget — which may help explain the delay in moving to raze the building. “That’s something we are working on,” said Barrett in response to a question if the city would pursue a tax-incremental financing district to borrow the needed funds for demolition. 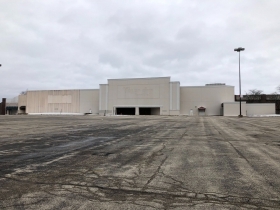 Should the city acquire the mall, it could merge the land from the mall with land freed up from demolishing the attached former Boston Store building. 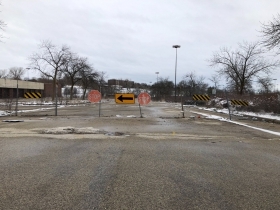 The city recently submitted a grant application to the Wisconsin Economic Development Authority for $250,000 to support demolishing the vacant department store. Bill Penzey, owner of Penzey’s Spices, bought the former Boston Store building in 2013 and attempted to acquire the rest of the mall, with the support of the city, for a corporate headquarters and warehouse for his company. 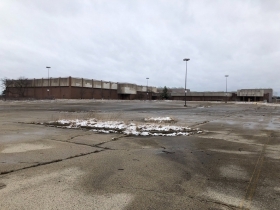 He wasn’t able to reach a deal on acquiring the mall and donated the Boston Store property to the city in December 2017. The city has also acquired the ring road that surrounds the mall. A design charette, intended to create a shared vision for the space, was led that year by UW-Milwaukee and the city. It identified future uses for the mall including an open-air retail market and industrial development. The mall opened in 1972 and closed its doors in 2003. Northridge failed for a number of reasons, including a lack of direct freeway access, chain bankruptcies, the cyclical nature of malls and a negative perception created following Jesse Anderson‘s murder of his wife in a mall parking lot and subsequent false claim that the couple was attacked by two black males. The mall’s competitors, including Mayfair, Brookfield Square, Southridge and Bayshore, have all received substantial public subsidies to help finance updates in the years since Northridge closed. Menards and Pick ‘n Save were brought in as new retail anchors, with outward facing stories, shortly after the mall closed. 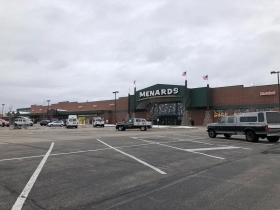 The Pick ‘n Save grocery store closed in 2015, but Lewis said the Menards and surrounding outlot properties provide a base to grow from in the future.